Phew! 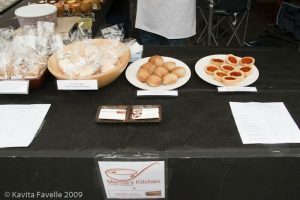 What a day we had hosting a stall at the Covent Garden Real Food Market! The culmination of several days of work dotted over preceding months, it was more successful than I’d dared anticipate and more exhausting than I’d feared! 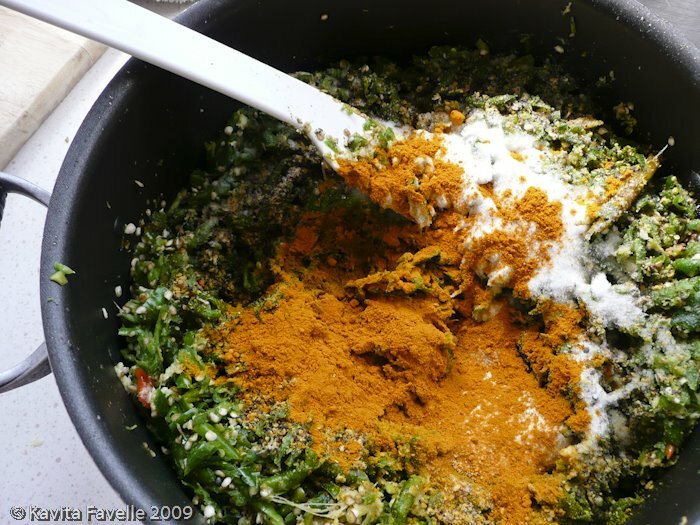 Having decided to brand my stall as both Mamta’s Kitchen and Kavey Eats I started thinking quite far in advance about what to make and how to package and present it. Pete, mum and I (and various friends) had many discussions on just what to make. We were working blind as we had absolutely no idea what kind of products would be popular and what volumes we might expect to sell. With a loose list forming, I went ahead and ordered 126 hexagonal 8 ounce jam jars, 126 mini 1.5 ounce jam jars, a couple of hundred white paper bags, 100 clear cellophane bags and some sticky address labels. I created an ever-changing and growing To Do list with tasks as diverse as sorting out business cards for Kavey Eats (we already had some for Mamta’s Kitchen), finding suitable and yet inexpensive table clothes, working out pricing, choosing bowls, plates and tasting dishes… and of course, making the produce. 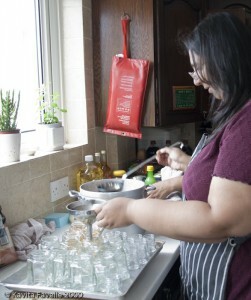 The jam, marmalade, chutney, pickle, ketchup making sessions (two full days in Luton) went very well. 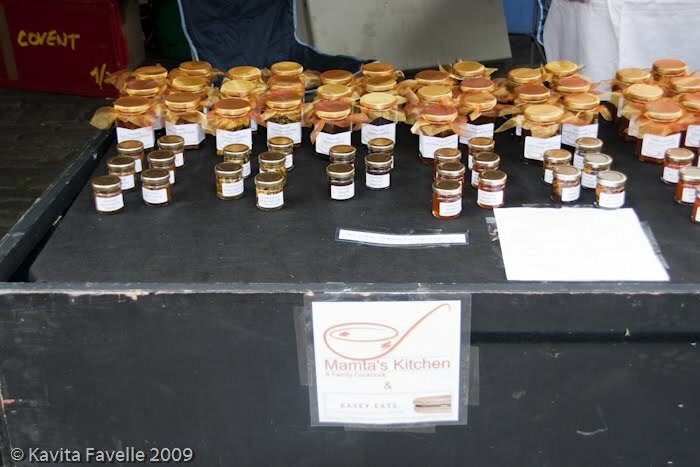 My mum and I, together with visiting cousin Adi, worked really well as a team and filled almost all the jars I’d bought! Jar labels were designed, redesigned and designed again. And then I spent over a day printing and sticking labels onto the jars, cutting (very approximate!) squares out of the inexpensive but stunning amber organza I’d purchased (at great discounted price) and attaching the squares to all the large jars with wayward elastic bands. Much swearing and groaning went on that day! 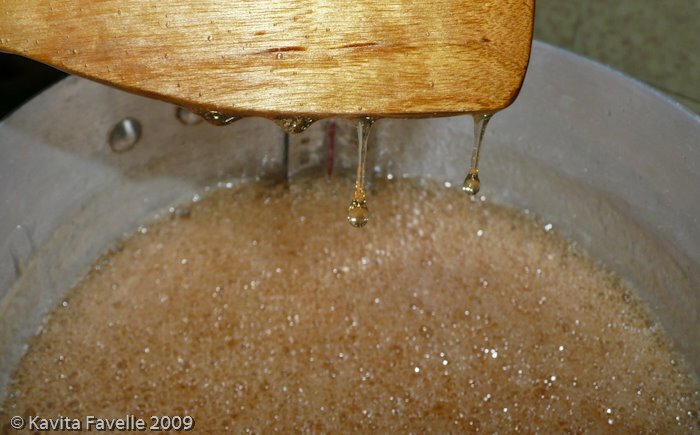 We had lots of successes with the jarred goods and one failure – the apple jelly (a recipe my mum’s made many, many times over several decades without any such problems) just wouldn’t set. 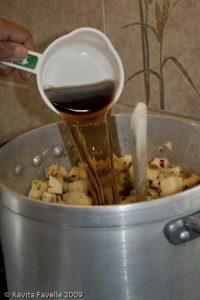 Reboiling took it too far in the opposite direction and we ended up with a tasty but much too thick and caramelised jelly. Far too delicious to throw away, a colleague of mine came up with genius idea to use the thick mix as a filling for jam tarts. 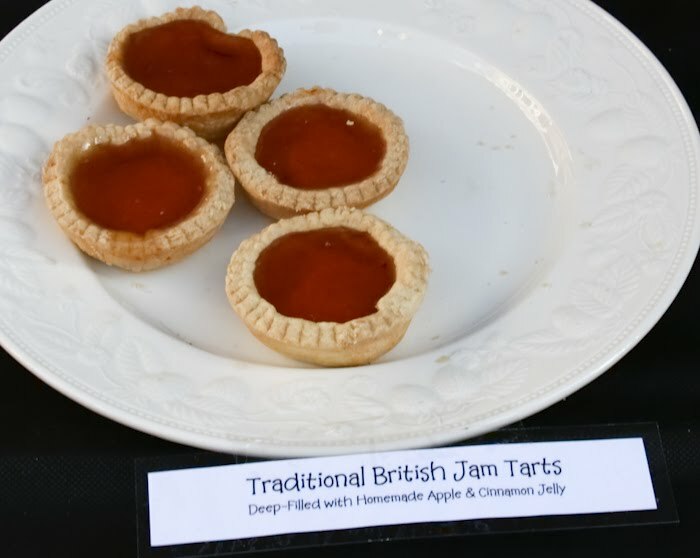 We trialled the jam tarts a month ahead of time and found the jelly made a really perfect filling and worked really well with the orange zest pastry we used. We opted for significantly deeper tarts with much more space for filling on the final run. 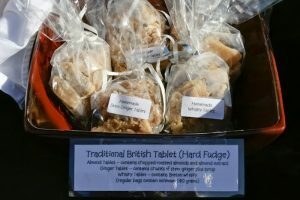 Another failure was my first attempt to make tablet fudge – that didn’t set either. Luckily, subsequent attempts, under the guidance of a tablet-making friend (thanks, Snow) came out much better and I made another few of batches (of different flavours) in the days before the stall. 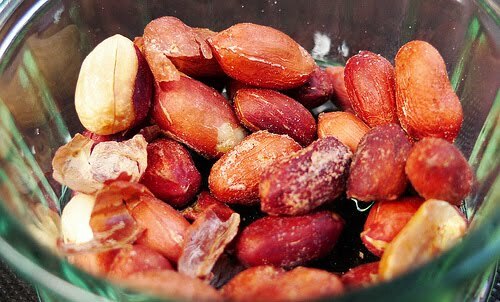 We also had some spice roasted peanuts and sweet pastry pieces that my mum and aunt had prepared to traditional Indian recipes. Although the official hours of operation were noon to 8pm we had to set off much earlier in order to be able drive into the piazza to unload before the 10 am cutoff after which no vehicles are permitted into the piazza. Two friends, Dave and Jamie, met us there and helped us with both the unloading and setting out all the goods. Attaching tablecloths and signs sufficiently well to withstand the winds was a challenge, even with super-sticky duct tape but eventually we were ready to go and open for business by about 10 am! And, if that wasn’t enough, Dave and Jamie returned at the end of the day, when we were exhausted, and helped us pack everything away again and get it back into the car. Guys, a huge thank you indeed! Of the products on sale I had plenty of samples available for the peanuts, sweet pastry squares, nectarine and amaretto jam and tamarind ketchup. 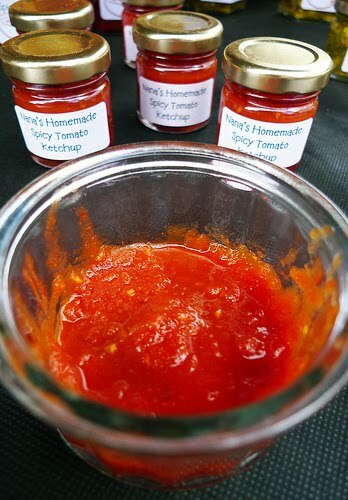 I also put out a sample dish of spicy tomato ketchup which I hadn’t intended to – this was because an early visitor grabbed one of the small jars and opened it to smell it before I could stop him, thereby breaking the sterilised seal. I quickly stopped him opening any others, and, unwilling to sell the one that he’d opened (and didn’t want to buy), I emptied it into a taster dish instead. 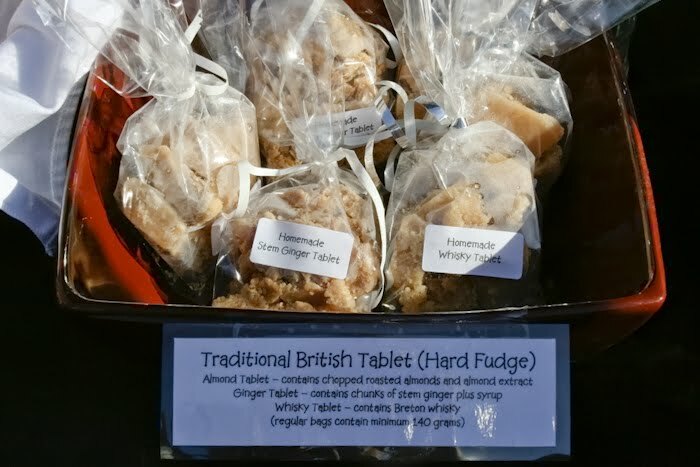 I also had limited samples of the various flavours of tablet and the shortbread biscuits. I didn’t want to break into the packaged bags to put more out, so I had the samples for these perched behind the display and only offered them to those who seemed interested. I had been worried that not offering samples of all our goods would make it hard to sell them. What I found though, was that people really appreciated being able to taste a few items. Finding these to their taste gave them the confidence to trust that they would also enjoy the other products. So all the jars did sell well, especially the minis but also a gratifying number of the larger ones. The spicy tomato ketchup, of which I had the least volume available, sold out completely. The tamarind ketchup also sold really well, though I’d made about 3 times as much of it as anything else so didn’t sell out. 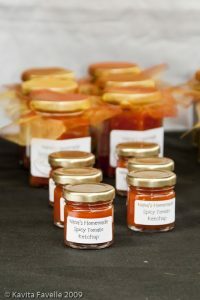 The rest sold reasonably evenly though the lemon pickle and apple and sultana chutney were less popular against the 2 ketchups, the 2 chilli pickles, jam and the marmalade. The tablet didn’t sell well and in retrospect perhaps having more samples out would have helped. 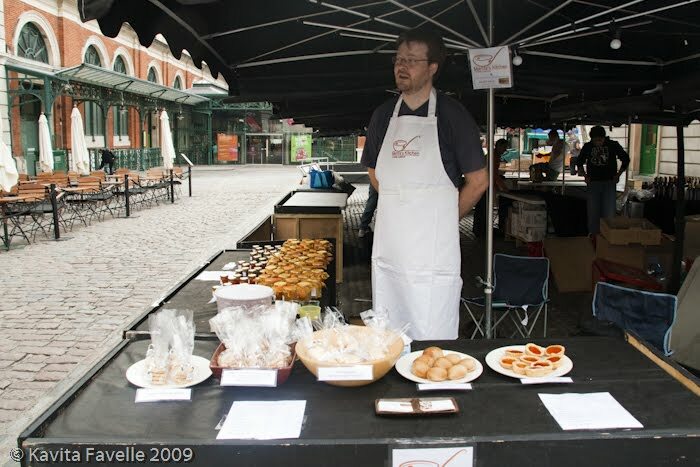 Then again, most samples were eaten by visitors who clearly had absolutely zero intention of buying – many didn’t even glance at the stall, passing by with eyes averted and hands reaching out as they went! 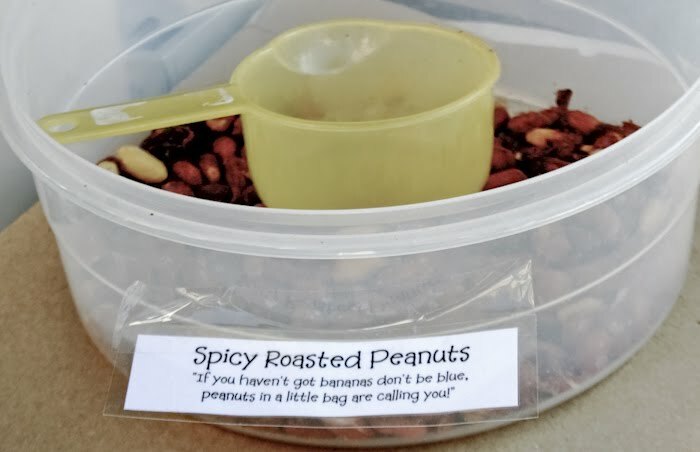 The sweet pastry squares sold out and the peanuts nearly did, though it’s fair to say that a large volume of both of these went as samples. 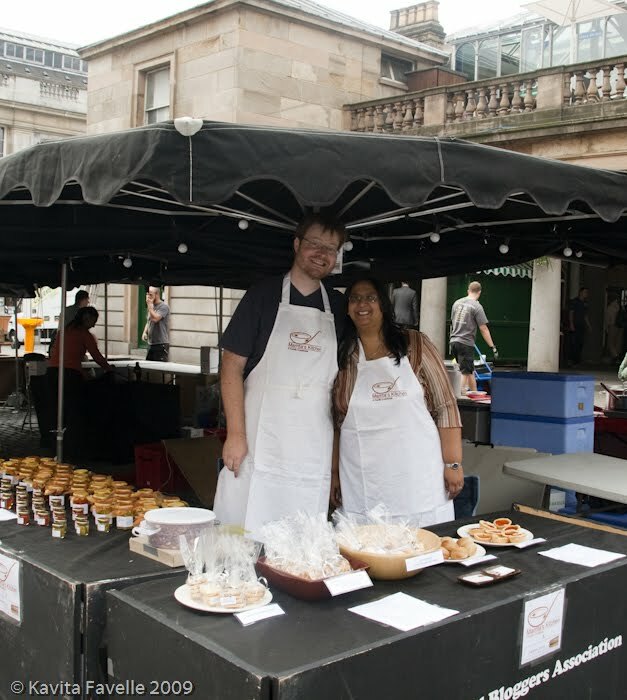 These two had sample dishes we refilled almost continuously but they were both relatively inexpensive give-aways that did a great job in attracting people to the stall. 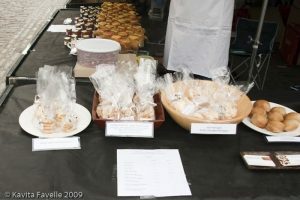 The meringues hardly sold at all which really surprised me given that they were juste £1 a bag and looked (and tasted) scrumptious. I didn’t have tasters out but figured most people would know what meringues taste like! I wasn’t sure about the treacle scones (and the recipe I’d found made significantly less than I’d expected). They smelled great but were quite small so I priced them at just 50 pence each. To my surprise, they sold out too, with one lady coming back for another having eaten the first. The jam tarts were popular too. They were, if I say so myself, rather beautiful and I think their vibrant orange colour and home-made look really helped draw people to us. 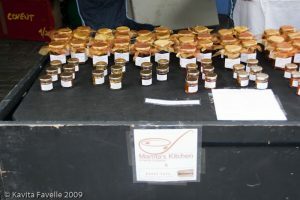 They sold pretty well and we only took a few home with us at the end of the day – we were quite happy about those few as we knew from our trials that they’d happily last really well in a sealed box, allowing us to enjoy them over the next few days. I know it sounds crazy but, before things took off, I had a real fear that we wouldn’t sell anything. Or that we’d only sell a hanful of items to those charitable friends who had promised to come and lend their support and took pity on us. Up and running by 10 am, when traders around us were still setting up, all was quiet. I popped over to a fellow early bird trader’s stall and bought some lovely croissants for breakfast and Pete and I settled into our foldable chairs to wait for visitors to stop by. (Mum arrived around lunch time). Just as I was eating my croissant, visitors began to trickle over. And sometime during the first half hour, to my surprise and delight, we made our first sale. That intrepid customer was a young girl, there with a little gang of her friends, and she picked out a bag of orange zest shortbread biscuits for £1.50. As she carefully pulled her little shiny pink purse from her matching shiny pink backpack some of her friends scorned her for wasting her money but she ignored them. And so, I thanked her for being our first customer of the day and offered her a complimentary jam tart. She walked away as pleased as punch, her scornful friend muttering under her breath about how it wasn’t fair that she’d bagged the freebie! Karma in action! 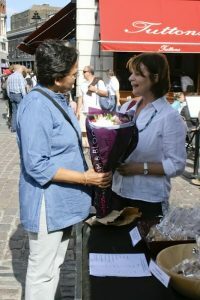 As is the norm for such markets, we had many people profess interest and tell us they’d come back later. Most of them didn’t, and that was fine – some people find it easier to say they’ll come back than a simple ‘no thanks’. But we did have some customers who, sometimes as much as an hour after their first visit, found their way back to buy some of our goodies. We had a family with two kids who politely asked if they could try the samples for the pastry squares before grinning and asking their parents if they could buy some. I took their parents’ response of “later” as an easy way to move them onwards, so was really pleased when they did come back for one bag of pastry squares and one of peanuts. 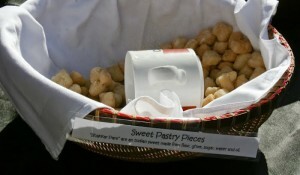 They were even happier when I suggested that I’d be happy to do the 3 for 2 that I had on the pastry squares and the peanuts and give them a third bag of their choice for free. Of course, we also had some amusing encounters. Whilst we certainly knew some visitors would not like our goods, some of the faces of sheer disgust pulled by some who tasted the samples were enough to make me giggle. And although we expected some freeloaders to do the rounds of the sample dishes, by the time all three of us had clocked one individual visiting us on at least 3 occasions, but more likely 4, and grabbing not just a peanut or two but most of the contents of the sample dish, I saw her swing up again and stopped her in her tracks. I said politely but loudly and firmly that, although they were free samples, they were there for all the visitors to the market and not a free lunch provided just for her. She stammered about it only being her second visit, to which I said that actually I’d personally seen her twice, and so had both mum and Pete. She didn’t come back again! One of the best things about the day was the number of friends who made the effort to come by and offer support. The vast majority were generous enough to buy something too, which really helped keep momentum going. 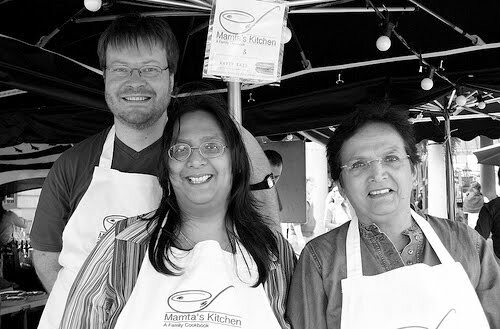 We had both what I call real life friends (though I count many of my newer online food community friends real life friends too, now) and online friends including fellow food bloggers, twitter folk and readers of Mamta’s Kitchen. 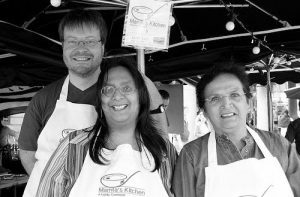 The two visits that stand out the most were from Elizabeth and Winton, both long-time visitors to Mamta’s Kitchen. Elizabeth came by with a beautiful bunch of flowers for mum. It was lovely to hear about her successes with our recipes and which ones the various members of her family most love. 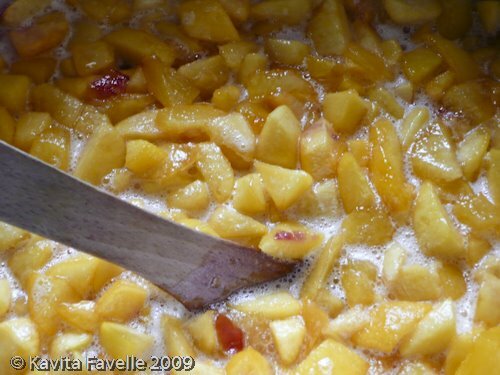 Winton also had a gift for mum – a jar of nectarine chutney that he’d made following one of mum’s recipes. Having interacted so much on the site’s discussion forum, it was so lovely to meet him at last. To all of you who were able to visit and were so kind about our stall, thank you. Niamh and Helen, thank you both for taking photos and blogging about our efforts. 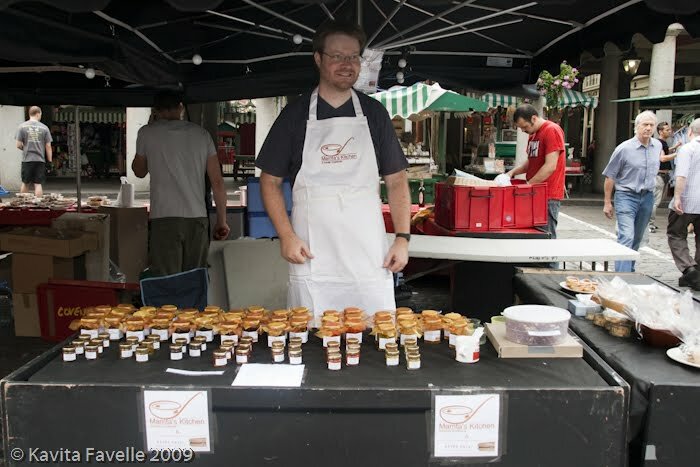 Next to us on one side we had the Neal’s Yard Dairy stall selling one of my very favourite blue cheeses, Stichelton. Another cheese man from Mons was one further up. 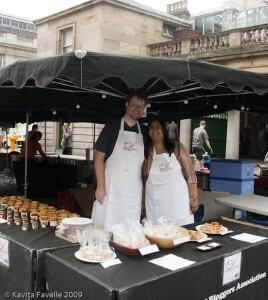 On our other side we had a stall selling Italian food such as lasagne. One thing I first discovered on buying the croissants was that the traders routinely give discounts to each other as a matter of course. This was the case for the few items we bought, and I did the maths to be ready to offer the same in return. 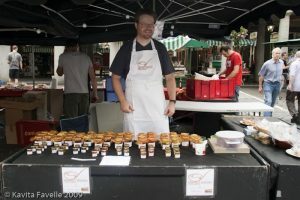 As it happens, chutneys, jams and sweet nibbles were not in demand and I didn’t make any trader sales. 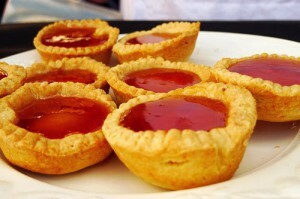 But I did give jam tarts to the cheese men, who seemed to enjoy them. I didn’t have much time to chat to traders during the day but did quiz the guys on either side of me towards the end of the evening. Interestingly, both said visitor numbers and sales had been much lower than previous weeks. And I’d thought it was quite busy! Particularly nice was the welcome from Niamh, who was herself hosting a stall for the third time and popped round a couple of times, once with prosecco, thanks Niamh! I knew it would be hard doing such a long day; I’m not someone with a lot of stamina at the best of times. The good news was how quickly the time flew by. With the exception of the last hour, when it was really quiet (though still a handful of sales), I was gobsmacked every time I glanced at my watch, thinking an hour had gone only to find 2 or 3 had passed! It was incredibly hard on the feet though. I found I really couldn’t sit down very much or for more than a few moments and even in my extremely comfortable flat, rubber-soled pumps the cobbled ground had an impact. I even went barefoot now and then! The next day, I just couldn’t put any weight on my feet. Even the day after, my feet still felt like raw meat and they were still aching on the Monday, 4 days later! As expected, we did have quite a bit of stock left. 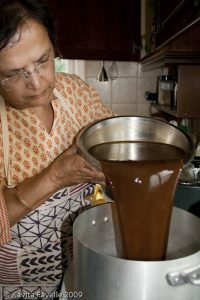 I’m Indian; genetically speaking it’s simply not possible for me to undercater. Ask anyone who’se been to one of my picnics! I’d gone in expecting to have quite a lot of the jars left, as I had made extra with the express intention of keeping some for Christmas gifts. I’d also had friends who wouldn’t be able to come tell me they’d be interested in buying some afterwards, which has proved to be the case. We gave much of the perishables to local friends and to family and kept a little for ourselves too. The tablet fudge I froze – my friend, Snow, had proven that freezing it doesn’t have a negative impact on the texture or taste. Whilst it’s been gratifying to be told that our efforts were quite professional and be asked whether I’ll be making this a regular thing, I knew from the moment I signed up that this was a one off. 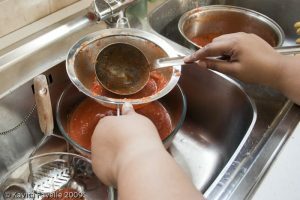 For me, it was all about experiencing something new and different, challenging and stretching myself to do something I’d not done before and simply finding out what it’s like on the other side of the kind of food stalls I love visiting as a customer. From that perspective, it was certainly a successful day and, despite the amount of work, extremely enjoyable. As for the big question on some lips – we did manage to make a profit though not a viable living wage! As well as the costs of the food and packaging, I’d never really thought about all the extra costs such as table cloths, disposable spoons for tasting samples, materials to make signs and decorate the stall and products and what about petrol, NCP charges and the congestion charge? And we didn’t even have to pay for the stall! With all these in mind, I have a renewed and even bigger respect for those who do this for a living as well as a better understanding of prices that are sometimes a little higher than one might expect. Thank you to Julia at the UKFBA and Nick, Ghislaine and Ben at the market for providing this opportunity. And the biggest thank you to Pete and mum for getting stuck in and making it possible. 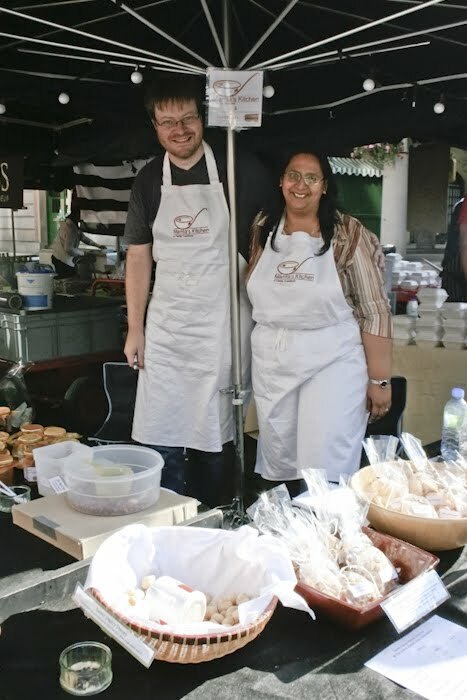 27 Comments to "Going Pro For A Day: Kavey Eats & Mamta’s Kitchen @ Covent Garden’s Real Food Market"
Wonderful report on the experience, Kavey! I've been thinking of you as I visit our local lovely Farmers' Market in the US where several vendors sell delicious baked goods, jams, cheese, etc. It IS a huge commitment. I made a batch of nectarine and amaretto jam just to send you good karma in the only way I knew how. It will be a treasured batch. Thanks for that idea. Great and wonderful report, Kavey! The food sounds delicious, I so wished I could have been there.Well done !!! Well done you, Kavey. Amusing story of the woman snarfing all the samples. wonderful to be able to follow you guys in this event through your blog and the very fine photos. Thrilled to hear that it went as well as it did, but I bet you're one hard a** saleswoman that is very hard to say no to 🙂 As for overcatering, have we ever had any shortage of food on the get-togethers? Wow, that's some write up. Love the story of the young girl with matching pink bag & purse LOL. So glad it was a success for you. Wish I could have visited. Kavey, this is Bookie. VERY well done, you, Pete and your mum! I've enjoyed your ongoing reports on the event (and the after-consequences, as sore feet are no fun, but someone almost everyone has experienced)and it was wonderful to see the photos and read more about the experience as a whole. Having done a brief six-week long stint as a cook at uni, I can vouch for the fact that the most off-putting component is that it is a tremendously physically demanding job, IMO. Loved reading about the young girl who was your first customer and how kind of you to reward her for her patronage. Sorry to read about “the pig” who decided to make your free samples her main meal of the day. Wonderful report Kavey, thanks so much! And I love the story of the little girl and that also of the freeloader! Congrats on the success of your (one-time) stall! First off I must say what a great read this has been and has shown what a life on a market stall is really all about. Then it has to be said that for a 'novice' to the trading game, in fact even for time hardened proffesionals the setup and display looks amazing ! 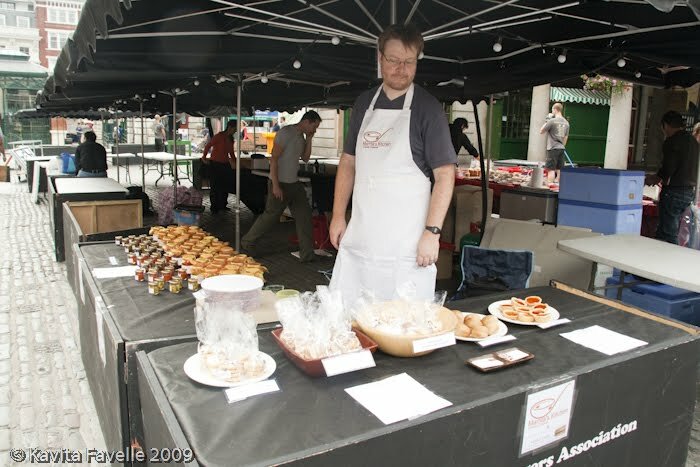 The amount of effort you have put into it looks like you were setting up a permenant shop not just a one off market stall! all top work, nothing but admiration and praise for all those that took part and helped out ! Looks like you guys have been busy, eh? Great pictures, it's just a shame I like so far away from London. I can't believe someone would open a jar like that! The ketchup was amazing though, I wish I had bought several jars. Will have to try the recipe. Well done. 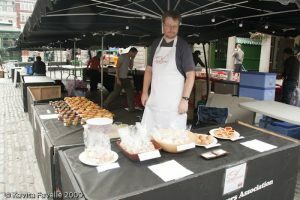 Luckily I had the pleasure of visiting the stall and can confirm it really looked as smart as the lovely collection of 'photos show. It was a sunny day and clear that 'the team' were having fun meeting visitors and the public at large. From Kavey's details of all the planning and tasks involved it only enhances my respect for any market traders. Having to unpack and then pack up, standing up all day come rain, wind, snow let alone make the home produce before must take a lot of organisation and stamina. With some trepidation I took a jar of chutney I had made for Mamta to try. I needn't have worried as it must have met with her approval as she later asked for the recipe. It was based on her Father's recipe from the Mamta's Kitchen website! I'm so sorry I couldn't make it down to see you on the day but having read your mammoth post I sort of feel like I was there with you…! I can empathise with the aching feet and we didn't even have chairs. We were exhausted the next day! Lovely photos from Niamh and Helen too. 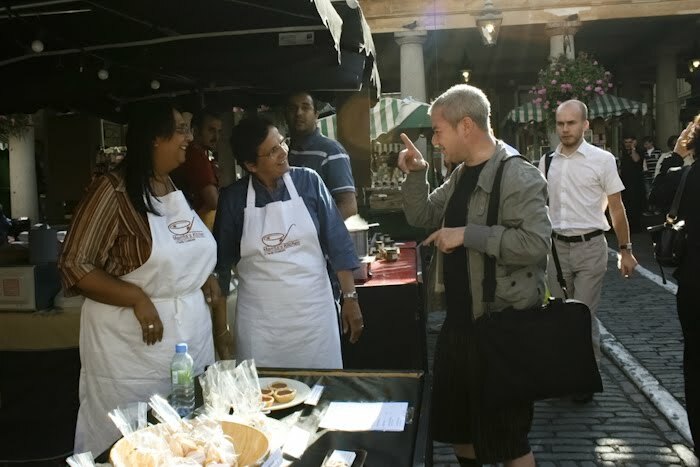 My daughter said your stall and array of fine food was very impressive. 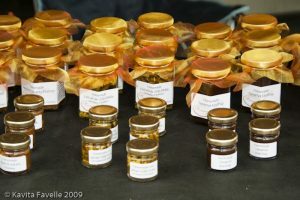 She bought a number of jars chutneys and pickles and I am looking forward to trying them when we get together in November. Thank you for wonderful account of all the hard yakka, enthusiasm, photos and the accounts of some of the people who visited your stall. Really enjoy reading both yours and Mamtas blog sites. I've been half heartedly toying with the idea of this, but cannot work out how to make an honest living. And well done to you all for running full steam at it with such enthusiasm and life. I really enjoyed reading about your market experience, laughing at the behaviour of the customers. Thanks for a great write-up! Oh Kavey, you did so, so well, and what a fantastic write-up. I'm sorry once again that I couldn't make it down. At least in reading this write-up I've been able to see your stall and read all about it. A huge well done you! You did a great job Kavey, well done. I aspire for a fraction of your organisation! That's a lovely post Kavey. It is really hard work on a farmers market, isn't it? To make money, you really have to look to the long term investment. It is hard to cover all your additional costs on the first outing. Btw they may be ungainly, but crocs are great for market trading … so will you have another go next year or have your feet had enough?! It is hard work yes. 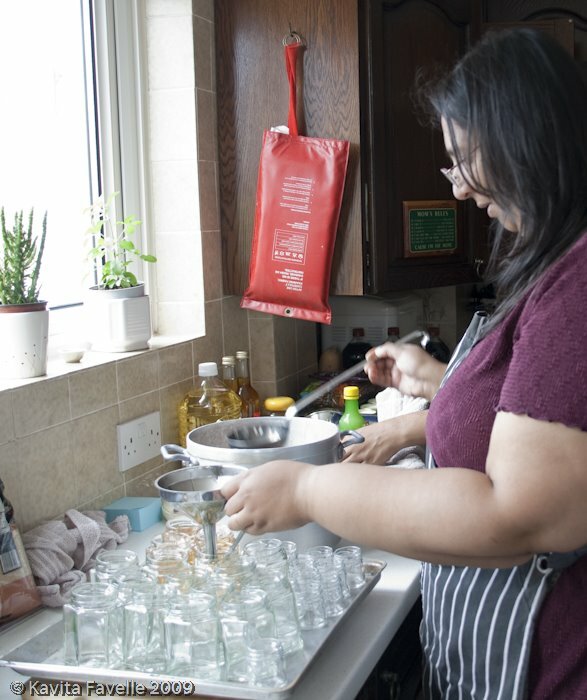 I did make a profit but not enough to counter the 5+ days of preparation in advance of the day itself – making the goods, creating and applying labels and so on. I know I could make a lot of bulk savings of both time and costs, if I were running regular dates but I doubt I could make a decent living from it, though I know others do. Oddly, I don't find Crocs that comfy but I was wearing my most comfy flat skecher shoes. But that long on one's feet was a killer regardless! I enjoyed reading about your experiences. Thanks so much for sharing.